How can I search *within* handwritten notes? I've been using EN for about a year, mostly to take handwritten notes at work during the day, and for course work in the evenings. My notes are written with a stylus on my Samsung 12.2 Pro directly into EN. Does EN have a feature by which I can search within the notes? Practically, I don't think I'd make the time to regularly export notes to another format like pdf or jpg, to have the search function - I'm asking if this feature exists within the handwriting format. Thank you DTLow for your reply. I saw that feature, but was hoping that there was, for me, another more practical solution. Like a number of people on this forum I am a user of the S-Pen and a fan of the way my writing was turned into text, which was searchable. Now that this option has been turned off (I'm concerned it's not a temporary oversight), I'm struggling to achieve the same functionality and productivity. Lucky users of the Samsung S-Pen get a text-to-characters translation when they handwrite. Because of the recent EN editor change, the pen's output no longer interfaces with the standard note layout, though the 'quick note' option apparently works. Samsung would have to make the pen compatible with the new 'Chrome Editor' as referenced in other threads. Thanks for your interest DTLow, and thank you Gazumped for clarifying my request. My goal was to see if there is a practical workaround to the EN editor change. I cannot find one that is nearly as convenient or productive as the feature I relied on. Evernote, if you're listening, please bring back the handwriting to text conversion for notes. For quick reference, here is one of the original threads on the subject. Tried the 'quick note' option - writing with the built-in stylus on a Note4. The heading (I think) was "Handwriting to text works like this" and the body was "This is a sample of handwriting to text" (honest). I had planned to show you a 'before' and 'after' pic but the processing is too quick. 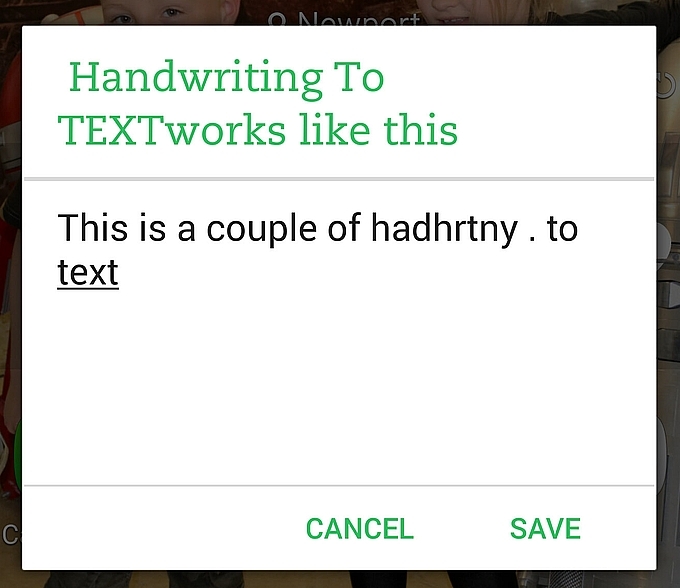 Not sure whether the obvious differences in translation are down to the software or my heinous handwriting, but I think I'll stick with a swipe keyboard. It works for me, anyway. Sorry, I totally got off track of the point in this discussion. My search feature on handwritten notes used to work a lot better than it does now. It rarely finds key words. This is especially true on more recent notes. Seemingly no more searches of notes photographed, even in a Moleskin notebook. Is there something I am potentially not doing to cause this? To search do I need to be scanning using Scannable?